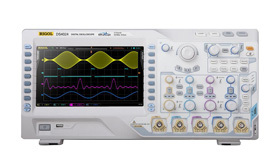 Rigol DS1000B series oscilloscopes are designed with four analog channels and 1 external trigger channel, which can capture multi-channel signal simultaneously and meet industrial needs. The powerful trigger and analyzer abilities make it easy to capture and analyze waves. Clear LCD displays and math operations enable users to view and analyze signal faster and more clearly.